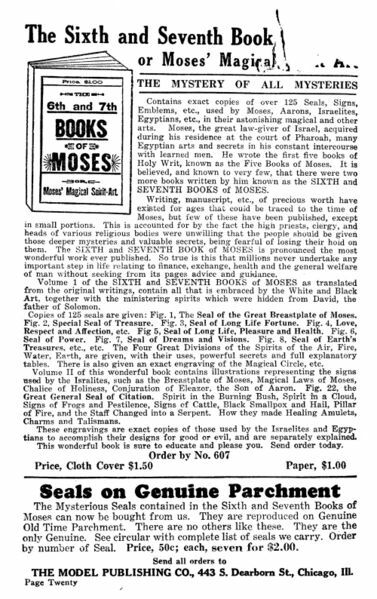 The 6th and Seventh Books of Moses, or Moses' Magical Spirit-Art, Volume 1, sold by Model, is only the first 64 pages of the book linked at Google, but includes the important stuff: the seals. While the book is very likely created in the 1800s by the original 'translator,' compiled from a variety of sources, the books sustained interest for magical purposes into the 20th century through Kabbalistic groups like the Golden Dawn. Symbolic magic was popular during the occultism surge of the early 1900s, and by the 1920s and 1930s had become a less-shocking part of common society than it had in earlier times. 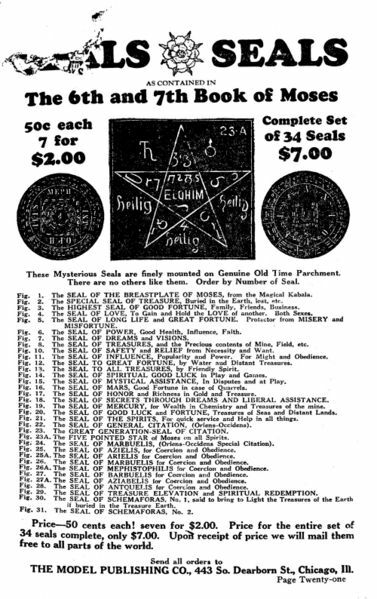 Model Publishing Company steps beyond just reprinting an old magic book by offering copies of the seals printed on "Old Time Parchment" -- probably modern paper artificially tanned and aged to look much older than it was. 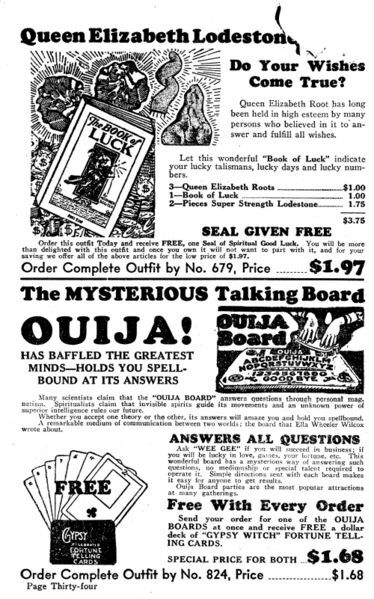 Purchasing seals wasn't a hokey or unnecessary addition to practicing the magic found in the Books of Moses -- like much of the magic seen in this catalog, modern versions are still available today.